*iPad, Tripod, Quick Release plate and camera not included. **An iPad app is not included. Multiple teleprompting apps are available on the App Store, however due to Apple policies apps must be purchased from the app store. Some of the available apps allow remote control of the prompter speed using another iPad or iPhone on the same WiFi network. If you do not use another Apple device to control your prompting or do not have a separate controller you will be unable to change the scroll speed while in use. Support for apps purchased through the Apple app store are provided through the support links for each app. iPad and Apple are Trademarks of Apple Inc. 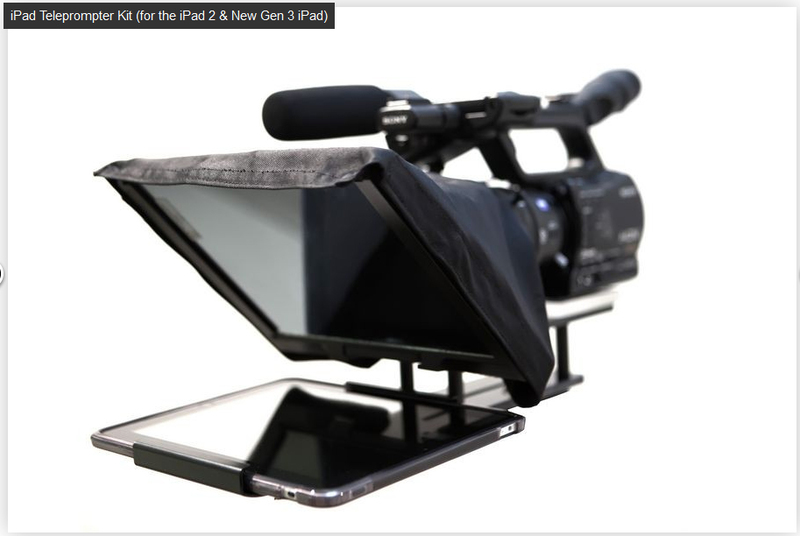 This iPad 2 & 3 teleprompter kit is designed for studio or on location use. ( or see the separate The iPad 2 & 3 teleprompter kit features an iPad case/mounting bracket for either the iPad 2 and iPad 3, and a teleprompter kit with hood, glass, and all required hardware. When filming anyone – actor or “real person” who must deliver a long passage of script straight to camera, it’s hard to beat a teleprompter. The on-camera talent can read even a lengthy monologue from the teleprompter and it appears they aren’t reading at all. See the iPad 1 kit here. The mirrors in this iPad Teleprompter are the same mirrors used in high-end teleprompters costing $2,000 and more. They are high definition compatible, and have the highest optical quality on the market. One side is mirror coated, and the other has an anti-reflective coating. This allows your camera to have excellent picture quality, while still providing you with the reflection you need to see your text. The coatings are durable, and you can clean them with standard glass cleaner.